For the month of December, Saraswathi challenged the International Food Challenge group with some Dutch recipes. Bitterballen, boterkoek, kerstkransjes and gevulde speculaas. I chose to make kerstkransjes as I wanted to take some festive cookies to Dubai for my daughter in law. She loves home baked cookies. Baking these cookies was a delight as I loved the way they turned out—- so festive looking. Kerstkransjes literally mean little Christmas wreaths. These cookies are tied with ribbons to decorate the Christmas tree. 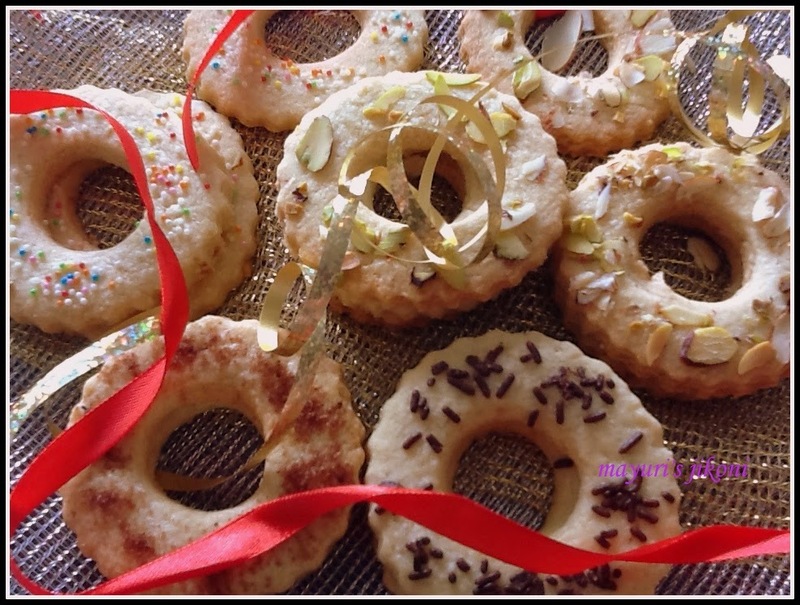 The best part is that these cookies can be decorated with sliced almonds, sugar granules, chocolate, sprinkles. Actually whatever you fancy. They are nice fillers for Christmas goodie bags or even as a present. The cookies turn out crisp and buttery, much like shortbread. If you don’t want them as a wreath shape, then you can have them star shaped or any shape you prefer. When I was in Primary school, I remember our teacher would request every student to bring something from home to decorate the tree in the classroom. I remember cautiously taking a red or green christmas ball, carefully wrapped in cotton wool and placed in a box.There were no bubble wraps in those days. Each and every student would then carefully place the decoration on the tree. As a teacher I would help my students to make lots of decorative things to hang on the trees at home. Do you have any unusual ideas of decorating a Christmas tree? Here’s my eggless version of the cookies. Sieve plain flour and cornflour together into a bowl. Add the cold butter and rub it into the flour. Add the zest and sugar and form a dough. Make the dough into a round ball. Wrap it with a cling film. Put it in the fridge for 30 minutes. Preheat the oven to 150 -160°C. Grease a baking tray lightly using butter or line it with parchment paper. Dust the rolling board lightly with flour.Roll the dough to about ½ cmm thickness. Using a fluted cookie cutter, cut round shapes. Use a small bottle top or small cookie cutter for the middle. Carefully place the cut cookies on the baking tray. Re roll the remaining dough and cut cookies. Brush the cookies with milk. Sprinkle the toppings of your choice on it. If you are going to dip or drizzle them in melted chocolate don’t add the toppings. Bake them for 15-20 minutes till they are lightly coloured. Remove the cookies from the tray and place them on a wire rack to cool. The original recipe requires 1 egg yolk. If you want to use it, add it with the sugar. Also use a lightly beaten egg yolk to brush the tops of the cookies. If you want to dip or drizzle the cookies with chocolate, do so after the cookies are completely cool. Adding lemon zest adds a lovely flavour to the cookies. No of cookies will depend on the size of the cutter. If you find the dough a bit dry, add 1-2 tbsp of milk. Look perfect as ornament on tree. These cookies are nice and rich. I liked the way you explained, how to give the shape to them. The cookies look so cute, perfectly done.. So creative..beautiful idea of decoration.